Use Shaxon's solid copper hook-up wire for your various small projects and hobby needs. Maximum 300 volts, 80 degrees Celsius, UL registered. 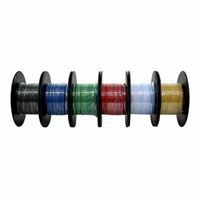 (6) spools of 25 foot solid wire in six colors and packaged in a convenient pull box. 18 AWG solid copper wire, black, blue, green, red, white, and yellow.